Letter from 11-year-old burglary victim to the thief that stole her birthday presents. It’s well documented that victims of burglary often feel traumatised and unsafe following break ins at their home, but sometimes we don’t appreciate the impact that this can have on children. 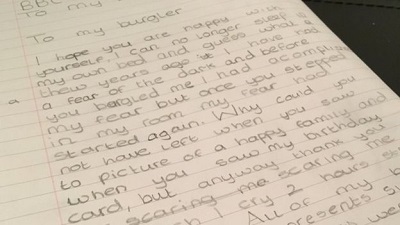 One 11-year-old girl from Doncaster has spelled out exactly how she feels after a burglar broke into her home by writing an open letter to the perpetrator. Paris Mulholland had just celebrated her 11th birthday the week before when her home was raided last month. Coming so soon after both Christmas and her birthday, the burglar got away with an iPhone, laptop and birthday money as well as a watch that had been handed down to her by a great-great-aunt. Other items belonging to her mum and younger brother were also taken. Paris was extremely upset after seeing her ransacked room where the intruder had not only taken her things but destroyed Lego models and other toys. I hope you are happy with yourself. I can no longer sleep in my own bed. Why could you not have left when you saw the picture of a happy family. And when you saw my birthday card. Thank you for scaring me so much I cry two hours straight nearly every night. All of my birthday and Christmas presents such as my iPhone, and laptop were stolen. Paris said that writing the letter did make her feel better and allowed her to control her feelings about it. She also added that of all the things stolen she particularly hoped that she might see the watch returned due to its sentimental value as an heirloom. The burglar has not been caught to date and recent statistics, such as South Yorkshire’s burglary arrest rate of just 12% and the fact that stolen items are never recovered in 87% of incidents, would suggest that the chances of doing so seem slim – even with a child’s plea from the heart. Chances are, even if the burglar does see Paris’s letter, they won’t be moved by the upset they’ve caused to a young girl – like she says “Why could you not have left when you saw the picture of a happy family. And when you saw my birthday card.”. They really don’t care and it’s unlikely they’ll ever have the ‘guts’ to give her stuff back. If you would like some home security advice to prevent this happening to you and your children, please call us on 0345 833 5543, send us a message or read our blog. next Police resort to breaking and entering!